Khierstyn Ross interviewed our COO Jean Leggett about OMSG’s startup experience and what’s on the horizon. This episode of Entrepreneur:Uncut features Jean Leggett, COO of One More Story Games. 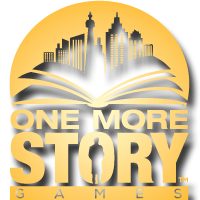 One More Story Games was founded in 2013 and began with five brave co-ops in January 2014. To date, One More Story Games has raised $240,000 from friends and family to launch its interactive story writing software, StoryStylus, which aims to create a new kind of social game, one that is focused on characters and exploring new worlds. StoryStylus is a platform for the creation and publication of interactive games or educational stories. You can create your own games, share them with friends and family, submit story games for publication and earn royalties. Click here for more info and to hear the podcast.